I had every intention of making this pie last week so I’d have plenty of time to write up my post. Except work got crazy busy, and I found myself with no time to write about pie much less to make one. I planned on buying the blueberries and nectarines fresh at the Farmer’s Market on Sunday. Except I got there too late and there wasn’t a single blueberry to be found. After getting the little one down for a nap and making a cup of tea, I planned a leisurely afternoon of baking. Except my husband called, stranded at work after dropping his keys down an elevator shaft. Seriously?! Nap, tea and leisurely baking — all out the window. I fully intended to follow the recipe’s instructions to let the pie rest for 30 minutes before slicing into it. Except it was 11:00 at night and I was tired. 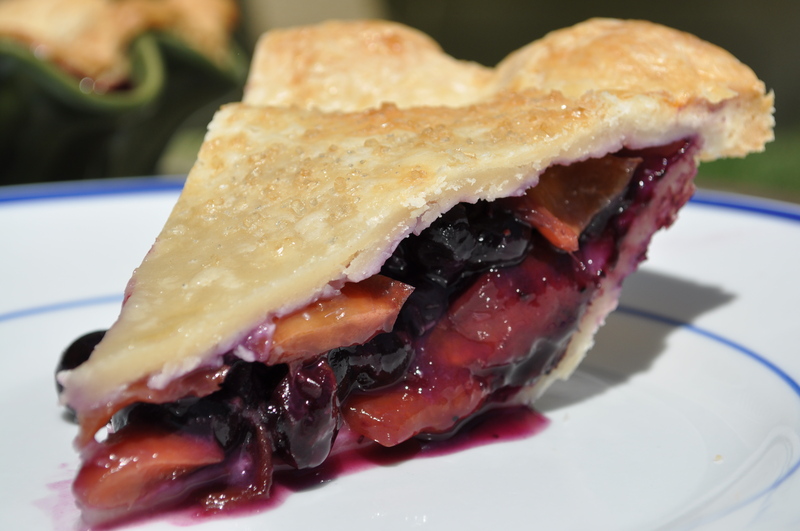 The first slice of pie was a runny, gooey mess, but I didn’t care one bit. I would have slurped this filling up through a straw. It’s that good. Thanks to our hosts this week — Liz of That Skinny Chick Can Bake and Hilary of Manchego’s Kitchen. Check out their blogs to hear their baking experiences as well as for the recipe itself. Trust me, you want this one. Yep I agree that everyone should bake this pie at least once in their life. Your pie looks delicious. Thanks! I would totally make this again over the weekend if we weren’t already baking the galette. Yum! It’s pretty hard to beat cherries. up close… your crust looks really buttery..beautiful!! one day i hope to get my hands on blueberries.. Thanks! Good luck with the blueberries. I take it for granted that they’re so easy to get here. Nice post – life can complicate even the most straightforward plans, but having a slice of pie at the end can really make up for it. Agreed. Pie makes everything better. …Did your husband find the keys? Happy Ending – I’m so glad for you! Cookies are always sooo welcome. By the way, I am slowly “collecting” cookies’ recipes around the world and would be so glad if you’d be part of this sweet project. Sorry I’ve just found out that the recipe index links does no longer work. That is one lovely looking pie – even after the hectic day that you had had. Thanks! Thankfully the rest of the week has been much calmer. I can’t wait to bake this one again. Soooo delicious! I enjoyed reading your post! 🙂 Glad everything turned out ok!! I couldn’t post a slice picture because my filling was much runnier than yours…yours looks great!